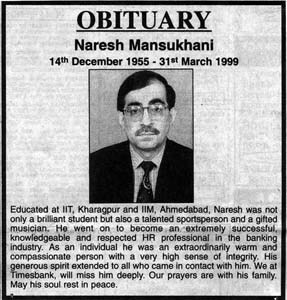 The obituary above by Timesbank was published in the Times of India, Mumbai edition on 01 April 1999. Reproduced below is the text of an e-mail message I sent to Venky and other friends from LLR Hall (IIT, Kharagpur) upon learning of the untimely demise of Mansukh. I was shocked and very deeply saddened to learn of the demise of Naresh Mansukhani on 31 March 99 through your (Venky's) mail today. Mansukh was my very special friend. Somehow, we became very friendly soon after he landed up in LLR and he shifted to my wing (A-top). He was a superb guitarist as well as a good pop singer. We spent ages discussing music, the tragic end of Jim Morrison (Doors), the idiosyncracies of Mick Jagger, etc., etc. 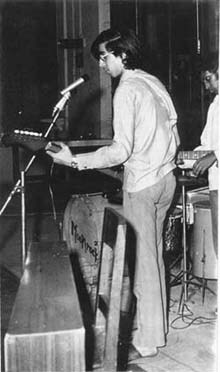 During SpringFest and other western music shows where Mansukh was the Hall's star performer on stage, I used to be in the 'pit' doing the sound mixing and balancing. And we spent ages in the music room at A-top. Mansukh was an extremely intelligent guy. I found him mature beyond his years when he joined IIT (was it in 1971?). He was also totally down-to-earth with no 'airs'. His 'star' status in the western music scene never went to his head. He was a perfect gentleman. But he did neglect his studies - I remember giving him frequent 'gyan' to concentrate on academics for a change. When he had to leave IIT we all were very very sad. But he came back to KGP after qualifying in the JEE once again!! But that was after I had passed out and so I don't really know much about that phase (will someone fill me up on that?). And after graduating he got into the ultimate B-school of India -- IIMA!! Thereafter he had an illustrious career in MNC banks -- he specialised in personnel management. The last time I met him (in Bombay, 5 years ago), he was the Country Head (personnel) in Deutsche Bank. Both of us used to live at Churchgate then and we visited each others' houses. I remember his wife as a very sweet girl who then used to work for some private domestic airline. I was preparing to leave the Navy then (in 1994, after 20 years of service) and I realised that I had NEVER prepared a bio-data in my life (having joined the Navy through a campus interview in my pre-final year)!! So I sought Mansukh's help and he not only helped me to prepare my CV but also introduced me to a headhunter by the name of Chander Batheja ('The Concept', Kemps Corner) who fixed up a few interviews for me and I eventually landed my first 'civilian' job with Mather & Platt (I) Ltd. at Bombay through Chander's outfit. 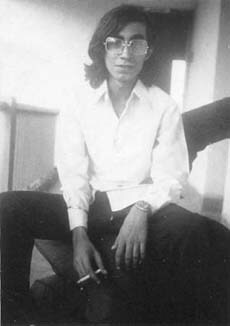 Mansukh grew up in Bombay (Colaba) -- studied in a small but very reputed school ('The Scholar') in Colaba. Years later, when I was checking out various schools in Bombay for admitting my own children, I made it a point to visit 'The Scholar'!! Do you know that while in high school, Mansukh used to be a part time DJ at the disco called 'Slip Disc' at Apollo Bunder? Music was in his blood. Naresh's father is a reputed advovate in Bombay and they have a beautiful house called 'Lily Lodge' on 3rd. Pasta Lane. After passing out of IIT when I joined the Navy and was posted on a ship in Bombay, I visited Lily Lodge n-number of times and met his parents and brother Andrew. Naresh too visited my ship at Bombay harbour many times. I remember the first time Mansukh came to my ship one evening in 1995 with some of his friends - I opened a bottle of champagne!! My first major purchase after joining the Navy was a music system -- when I wanted to check out this second-hand Ampex tape deck (7.5" spools, 3-head, 7.5 inch per second), I took Mansukh along to the seller's (Rusi Mahudawalla, Churchgate) house to try out the system and bought it after his recommendation. And thereafter my main supplier of music was again Naresh. 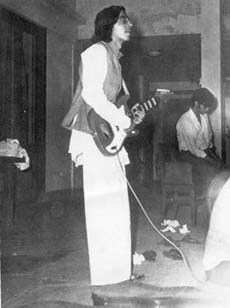 He had one of the best collections of pop/rock in Bombay. It is only through Mansukh that I discovered Emerson Lake and Palmer, Moody Blues, etc. I don't want to mention Pink Floyd because I have this 'fear of crying'. I used to lovingly call him "FREAK". Because his favourite statement was "Freak Out, Man"!! Yes Mansukh, I'm still freaking out, but why did YOU have to stop freaking out so soon? Adieu, Naresh Mansukhani. I salute you. Your life has not been in vain. It has touched people -- whether in Colaba/Radio Club/Slip Disc, or in LLR/KGP, or in BankAm / Duestche Bank / Timesbank or wherever. And the people touched by you will carry on your legacy.